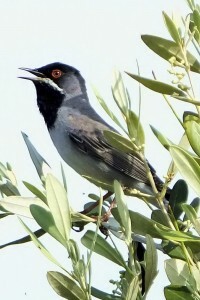 What makes Lesvos so special for bird watching? If wild birds could choose their all-time favourite Greek island, it’s a safe bet that they would tick the box marked LESVOS, and if birdwatchers throughout Europe were asked to make the same choice, most would tick the same box. 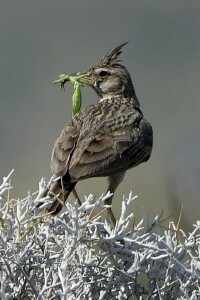 For some reason that no-one has really put a finger on, the island’s 1,630 square kilometres are a magnet to hundreds of thousands of birds, from big, broad-winged birds of prey to the tiniest of mites, all migrating to and fro between their African wintering grounds and huge landmass of Europe. It is true that Lesvos has wet winters, lots of marshy areas in the early part of spring, many trees (including 11 million olive trees), big, sheltered bays that cut deep into the island and a good selection of food-rich rivers and wetlands. But so do other Greek islands, principally near-neighbour Limnos and the famously green Corfu. So why birds leaving the northern shores of Africa head up along the Turkish coast for an extended stop over on Lesvos remains something of a mystery when there are so many other routes they could pick. But they do, and that’s really all that matters. It is no coincidence that almost all the major wildlife holiday companies, certainly those in Britain, have Lesvos high on their list of must-see destinations. But it’s not just because of the huge variety of birds (lists of 200 species in a week are not unusual among keen birders) but also because of the mesmerising variety of other wildlife. If you are into orchids, wild flowers, snakes, or creepy crawlies of almost every description, you will be in heaven in Lesvos. For many years, the hotspot for birdwatchers has been the little fishing village of Skala Kalloni, popular because of its location near the centre of the island and its good birding areas along the rivers — usually still flowing into May on each side of the village. Each year, from the last two weeks of April through the whole of May, the people who stand out from the crowd there are those who DON’T have binoculars round their neck. 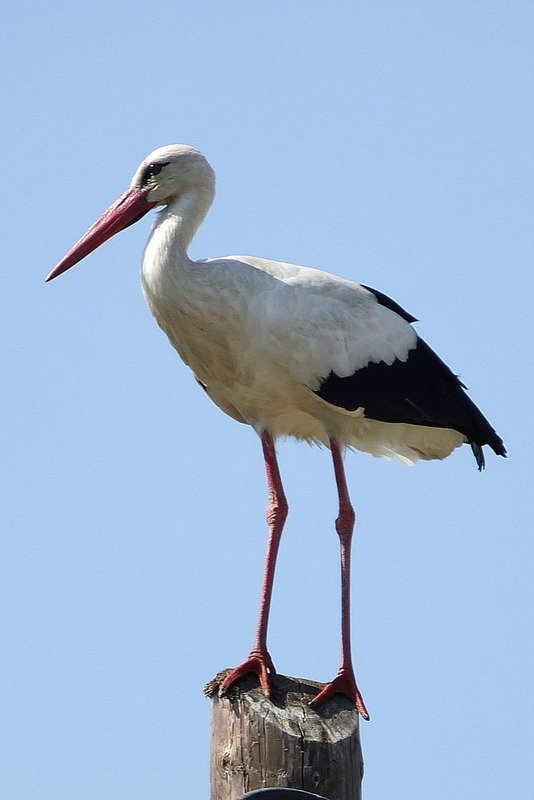 But in recent years, more and more birders have been waking up the fact that there’s a lot more to the island than Skala Kalloni and its wetlands. More bird watchers are choosing Molyvos, Petra and Anaxos. In fact, for people who like to stay in a truly historic harbour town, with olive grove walking, hills and pretty mountainside villages all around, Molyvos is the only place to be. Birdwatchers who stay in the more hilly north of the island invariably clock up as many birds during their holiday as those in the central flat-lands. Molyvos is also THE place to catch up with one of the island’s star birds, the mega-rare Ruppell’s Warbler. 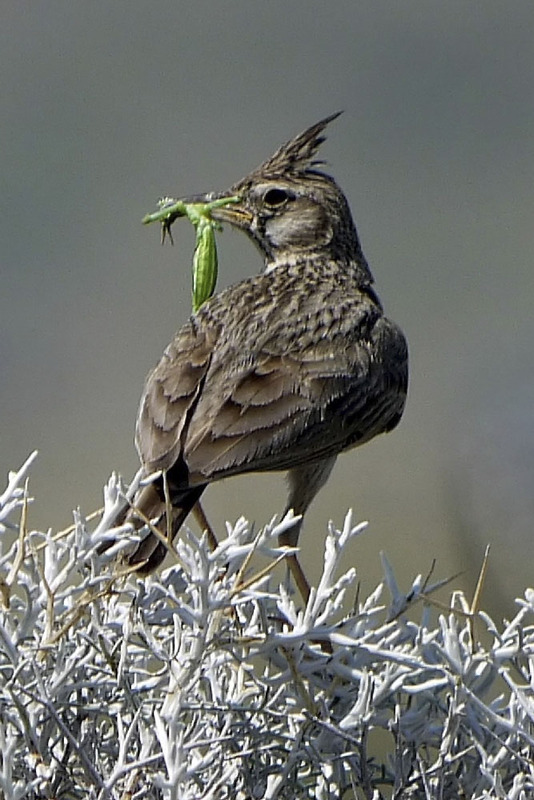 Sightings of this beautiful small bird – smaller than a sparrow — can virtually be guaranteed on the scrubby headland at Kavaki, just before the famous spot where tourists arriving in Molyvos get their first awe-inspiring view of the castle-topped town. In spring, whatever time of day, there’s usually a line-up of birders with telescopes and binoculars lining the seaward wall of the lay-by. Ruppell’s nest each year in the scrub. And the gorgeous male, with his distinctive white moustache, invariably pops up to sing his head off from a bush or overhead wires. 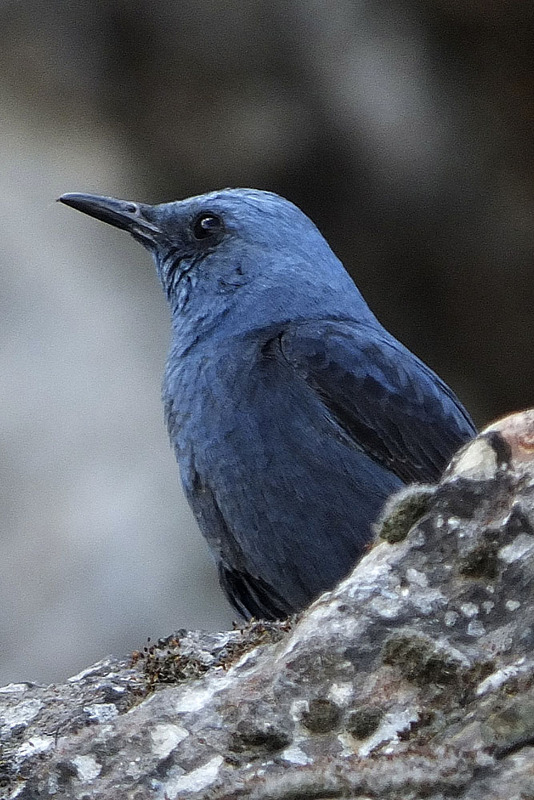 It’s also a good spot to see blue rock thrush, with the male’s vivid blue sheen standing out against the dark ocean below, and also peregrine falcons and kestrels, which often nest on the cliffs. 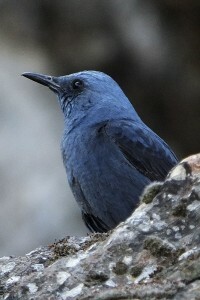 The other star bird is the Kruper’s nuthatch, but it takes a 45 minute drive from Molyvos to Achladeri pine woods to see that. 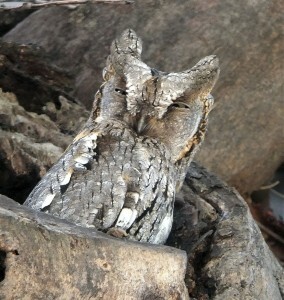 Some years, depending on how wet the early spring has been, there seem to be wall-to-wall birds on Lesvos. Sometimes, it can be a case of hearing without seeing with birds like the secretive Scops owl. The monotonous “peep”, reminiscent of the Greenwich time signal, can usually be heard in the plane trees around Tropicana square or in the eucalyptus grove near Molyvos taxi rank and in the village of Petri. 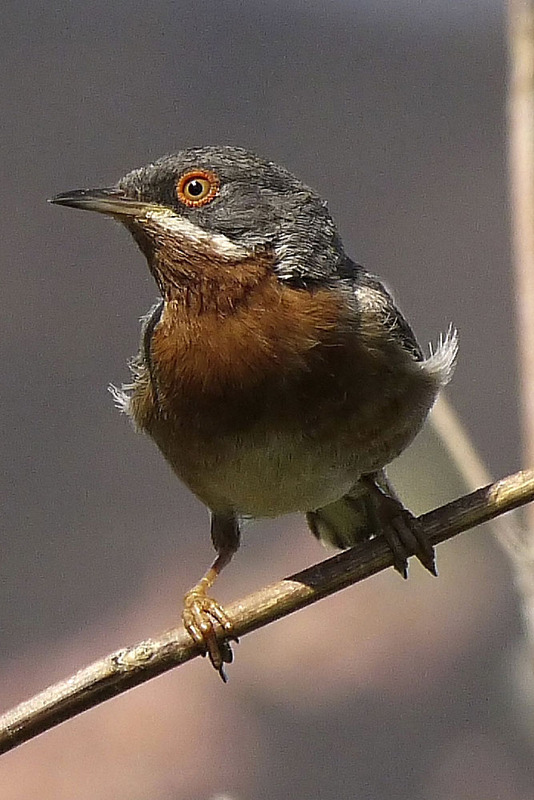 Arm yourself with a good guide [Steve Dudley’s A Birdwatching Guide to Lesvos is the best and most up to date] and the island will provide the bird watching holiday of a lifetime. 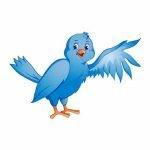 Place your cursor over a picture for more information. If you have been inspired by a bird watching visit to Lesvos or you have tips or stories to share, please leave a comment below. We would love to hear from you. By Frank on 9th August 2012. As well as Steve Dudley’s bird guide to Lesvos, he also has a website which is regularly updated year-round with details of bird sightings on the island. It is http://www.lesvosbirding.com. Anyone planning to bird watch on foot (usually the only way to get deep among the olive groves and gorges around Molyvos) should arm themselves with one of the excellent walking books by Englishman Mike Maunder. They are published in several languages and are readily available at shops on the island. Birdwatching is a hobby of mine too, I’ve never been to Lesvos, maybe one of these days I can travel there and see some of the birds, I think you have some birds there that I haven’t seen before. Thanks for introducing some places to go to!